The Missouri Breaks National Back Country is a mostly isolated area north of Lewistown inhabited by an abundance of wildlife. Elk, deer, antelope, big horn sheep and hundreds of species of birds make this terrain their home. Surrounded by the Little Rockies, Judith, Bear Paw, and Moccasin Mountains, the area extends over one hundred miles. Native Americans originally lived and hunted the Missouri Breaks area before it became an open range where stockgrowers grazed their large herds. This historic landmark points east out of Winifred with coulees and rolling prairies overlooking the Missouri River. The Upper Missouri River Breaks Interpretive Center was architecturally designed to resemble the White Cliffs. Its classroom provides viewing of a twenty minute film on the cliffs as well as boating information for the river. Travel through the Missouri Breaks can be a testy experience. When wet, the area turns to gumbo and travel becomes near impossible. Furthermore, travelers will find cell phones ineffective and homes few and far between. The best way to travel through this area is with a 4-wheel drive and high clearance. 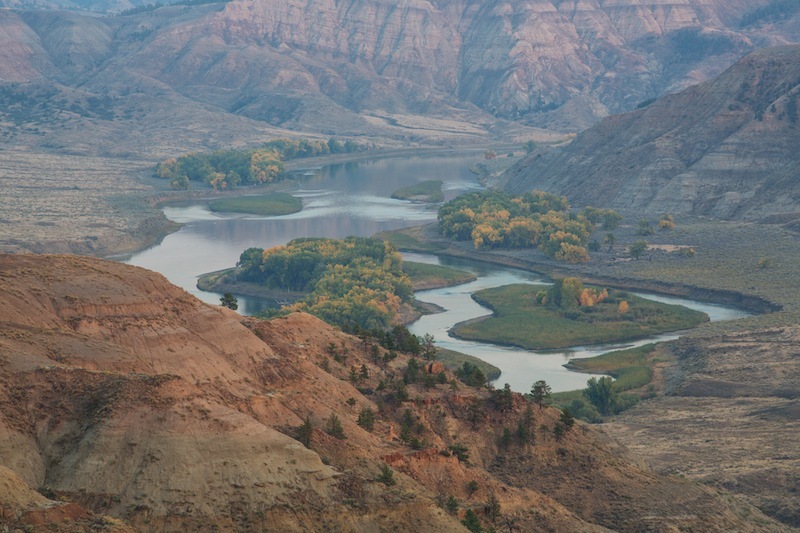 Since much of the area is not accessible by road, it can also be seen by hiking or floating along the Upper Missouri River.